How many times have you heard somebody say they can tell when food contains MSG? It’s a myth, traceable to a short letter to the editor of the New England Journal of Medicine back in 1968 by a doctor describing some strange symptoms he felt after visiting a Chinese restaurant. Despite intensive study since then, nobody has been able to prove that MSG is bad for you. People who claim they are sensitive are probably unaware that glutamate is all around us. Japanese restaurants (especially in Japan) use far more MSG than Chinese ones. How often do you hear somebody insist that they can’t handle Japanese miso soup? Human breast milk includes glutamate — more than ten times as much as cow’s milk. Babies are literally born attracted to that taste. 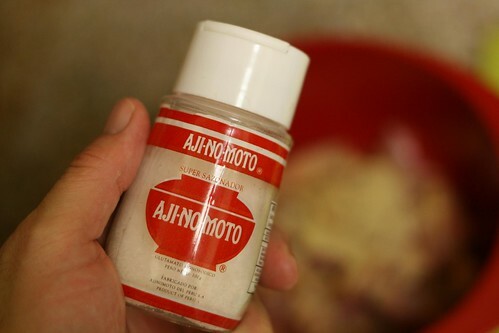 Thanks to the Japanese scientist and co-founder of the Ajinomoto food corporation, that yummy umami flavor has been packaged into its essence, monosodium glutamate (MSG). I bought a bottle today: it looks similar to a salt shaker and costs about $5. Fairly tasteless on its own, shake it on food and you will sense a rainbow of flavor. Your tongue literally goes crazy when it feels the glutamate. As MSG crystals come in contact with water, they decompose into a glutamic acid whose taste intensity is inversely related to the acidity of the rest of the food. Originally manufactured by fermenting wheat protein, these days food scientists rely on Micrococcus glutamicus, a bacterium that cranks out glutamic acid by the bucketful, awaiting the simple separation and purification process that turns it into MSG. I’m going to start using it on everything.